Depending on the year, Cincinnati and Northern Kentucky can experience dramatic winters with heavy snow and icing. 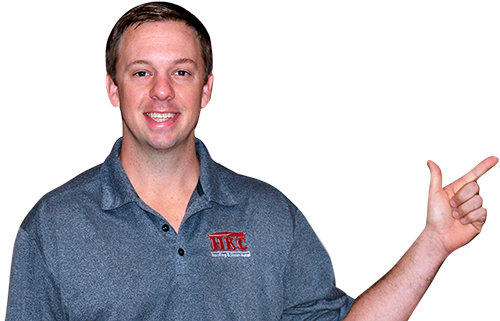 Let HKC Roofing help determine how to best control the snow and ice on your roof. Over the past 25 years we’ve seen every type of weather there is to offer. Some years we don’t see but an inch of snow and the next year we can get more than 40’’ of snowfall. I’m sure we all recall the 2013-2014 winter when we received over 47’’ of snow! Cincinnati tends to get more snow than we realize, it seems the intermittent mild years makes everyone forget about the hazards created by the snow and ice. In these years the snow is bound to cause issues, mainly with ice damming, falling ice hazards and gutter damage. While snow guards and snow retentions systems won’t help with ice damming, it will help with falling ice and gutter damage. When snow and ice slides off the roof it has the potential to do grave harm to those below. It will almost always damage the gutter system as well, pulling the gutters right off the building, another hazards for people and property below. The benefit of installing snow guards or a snow retention system is to keep the snow and ice bound together on the roof. This is especially important on metal, slate and tile roofs where the surface is slick and the snow tends to slide more easily. Steeper pitch roofs will have a more dramatic snow-slide than low pitch, requiring the same snow retention considerations. 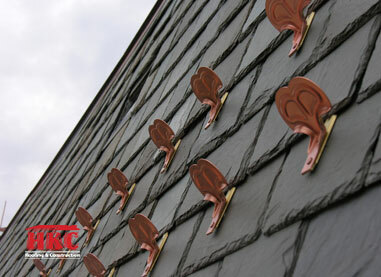 At HKC Roofing, we offer a wide variety of snow guards, many of which add character and charm to the structure. These products are designed to perform almost indefinitely, made of copper, brass, bronze and cast aluminum; they are built to endure generations of tough winters. 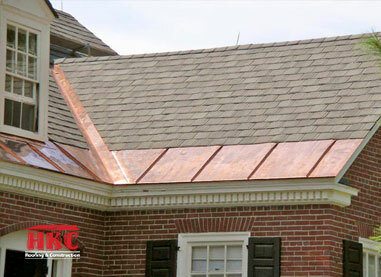 Call HKC Roofing if you would like an evaluation of your home or buildings accumulation of snow and ice. We’ll be sure to point you in the right direction when selecting a tried and proven snow retention system.